The ZTX Automatic Transfer Switch combines reliability and flexibility in a small, economical package for transferring loads between the utility and generator sets. The XTX Transfer Switches work together with any remote-start generators using two-wire control. The control monitors utility and emergency standby power generator set power. When utility power fails or is unsatisfactory, the control starts the generator set and transfers the load to the generator set. 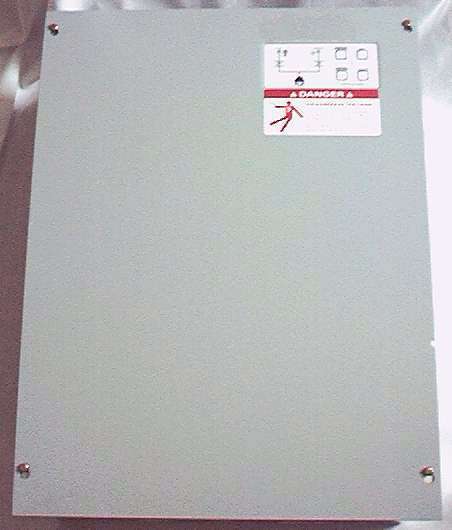 The transfer panel immediately senses when utility power is restored. It automatically transfers back to utility power, shutting down the generator and instantly resetting itself for the next power interruption. No action is required by site staff. 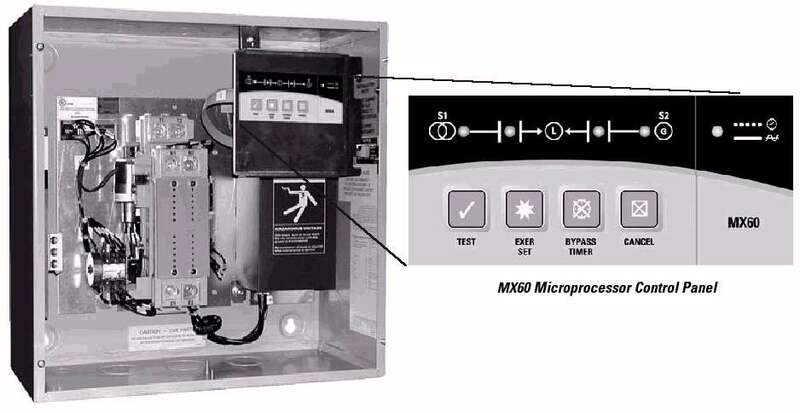 The transfer panel and control are mounted in a single door NEMA 1 (indoor) or 3R (outdoor) enclosure. Mechanical contactor interlocking prevents simultaneous closing of normal and emergency contacts. Independent break-before-make action positively prevents dangerous source-to-source connections. Reliable, microprocessor based control system with undervoltage monitoring of the utility and voltage and frequency sensing of the generator, standard time delays. This switch comes standard with GE Zenith's MX60 control panel (supersedes the R-M4 control panel). This controller provides timing functions, voltage & frequency sensing, exerciser and operates the external membrane keypad/indications. 2) This switch is not service entrance rated. This generally means that you need a service entrance rated device between this switch and your utility meter. 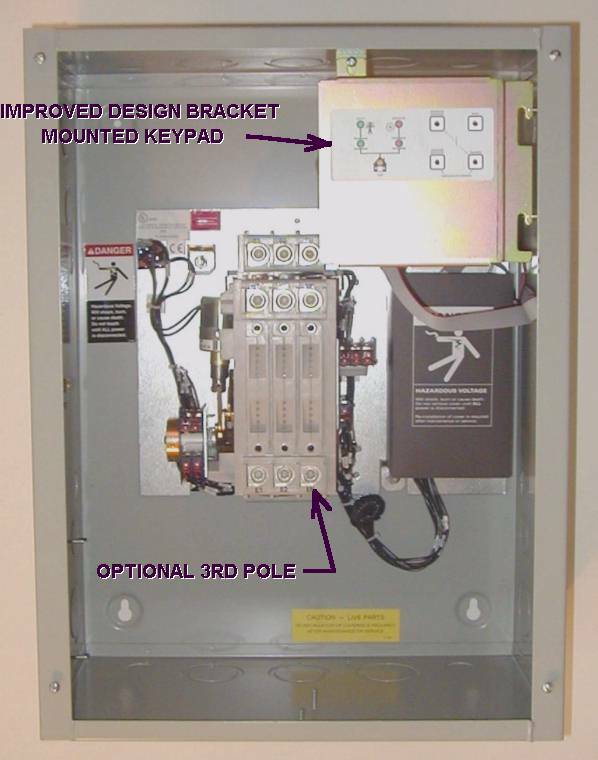 3) The standard ZTX contactor comes with 2 power poles to switch the two hot leads of a 120/240V system. It does NOT switch the neutral, which is acceptable in most areas of the USA. See article 250.20 of the 2002 NEC. If there are special requirements in your area that require switching the neutral (as dictated by local codes or electrical inspectors) you must use the ZTG type transfer switch. 4) Two single pole double throw auxiliary switches (1 on the utility and 1 on the emergency contactor) are available as an option. These are useful for remote indication of the switch position or to turn off loads that should not run when on generator power (such as large heat pumps or central air conditioners). To order use the drop-down menu below. 5) CAUTION FOR OLD DESIGN SWITCHES - Use care when removing the front cover of this panel. Loosen but do not remove the four cover screws. Lift cover off the four screws and hang it on two screws (2 bottom or 2 right-hand). This will prevent damage to the cable that connects to the keypad on the back of the cover. This type of damage is not covered under the warranty. This caution does not apply to new switches that have keypad mounted inside on bracket and operable through cutout in cover. 6) WIRING - This switch provides a single isolated contact for controlling the genset. The contact closes when the genset is to start and run. Click here for sample interconnection diagrams to Cummins gensets or click here for connections (sh 1 & sh 2) to Cummins PCC2100 gensets. Battery charger BATTEND022 or the factory wired and installed charger below. Replacement Parts for GE Zenith switches.